Play N Go do a very nice line in these arcade games which combine some exciting online slots action with plenty of high quality animations and bonus features; this one’s called Viking Runecraft (check out Cloud Quest, another favourite) and you can read all about it below. Viking Runecraft is played on a 7×7 grid through which we can see a harsh Nordic landscape of bare mountainsides and chilly weather; a fearsome-looking Viking stands guard on the right hand side of the gameplay area. In this game winning combos consist of at least five symbols connected horizontally or vertically. There are nine base game symbols and these consist of some Viking gear – hammer, helmet, axe and pendant – along with five runes of various colours. Our amateurish attempts at translation suggest these mean wealth (brown), ulcer (yellow), man (blue), ‘one of the gods’ (green) and then a purple one of which we are unsure. Behind the grid you will see that there is a pattern lit up in blue and each time you create winning combo which covers one of these positions it will change to yellow. When the entire pattern is yellow the levelling up procedure will take place. God of Thunder – five to nine symbols are turned wild. 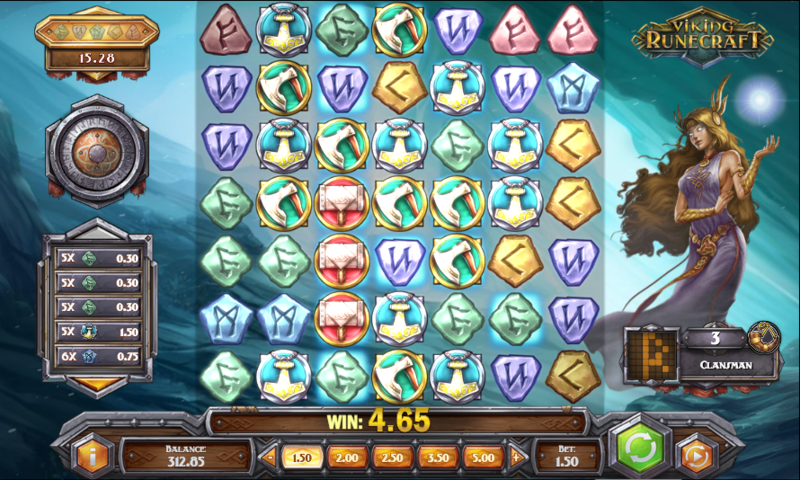 God of Wisdom – two vertically connected pairs of wilds appear on the reels. Goddess of Beauty – a cluster of four wilds is placed on the grid in various positions until a win is awarded. God of Guarding – one wild is placed on each row. When a pattern is cleared you will also get to play the Runes of Valhalla bonus game; this is a Wheel of Fortune game which will win you the cash prize in the top left hand corner of the screen if you land on a rune. 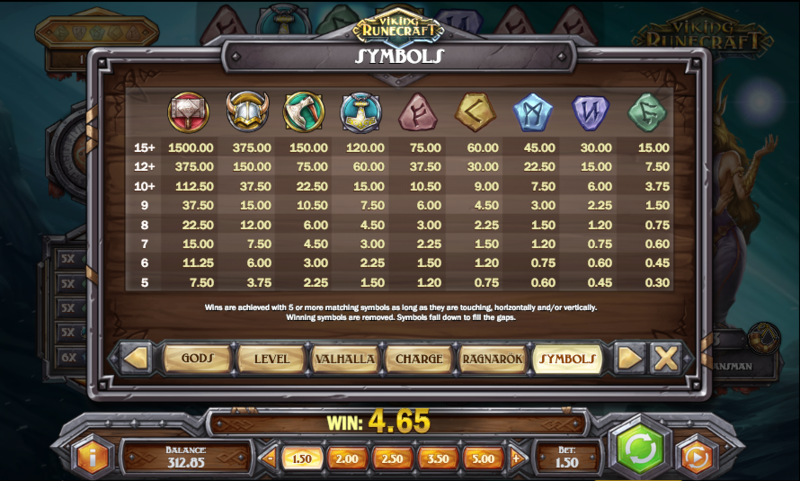 That cash prize is incremented during gameplay by completing winning combos containing each of the five runes. Fury of Fenrir – four diagonal lines are picked then two are removed and the remaining ones are transformed into matching symbols. Judgement of Jörmungandir – a snake travels across the reels, removing symbols and transforming some of the remaining ones into matching icons. Scorching of Surtr – three different symbols are picked and those surrounding it are changed to match them. Lure of Loki – two different symbols are selected then all of one type are removed and replaced by the other symbol. When the feature ends the meter resets itself. This is triggered by completing the Charge of Destruction meter twice in the same spin or adding twenty more symbols to the meter during the Charge of Destruction feature. The reels will begin to spin and each time you fail to win, one of the Charge of Destruction features will be awarded; when all of those have occurred the round is over. During this round the meter displays multipliers and as you collect winning combo symbols on each spin, the multiplier value for that win is increased up to a maximum of 15x. Viking Runecraft is a brilliant slot which we can thoroughly recommend as a way to spend some of your game-playing time; there’s always something happening, it looks great and there are some big wins to be had in any of the bonus features. It comes with an RTP of 96.70%.